My very first novel, Sing the Light, and the two novels that followed it, are set in the world of Nevya, an ice planet where energy is generated psychically, focused through music. It was a world that sprang from my own long experience as a musician and singer, that expressed my feelings about what it is to live and work as an artist, to make sacrifices, to develop discipline, to commit fully to the life. 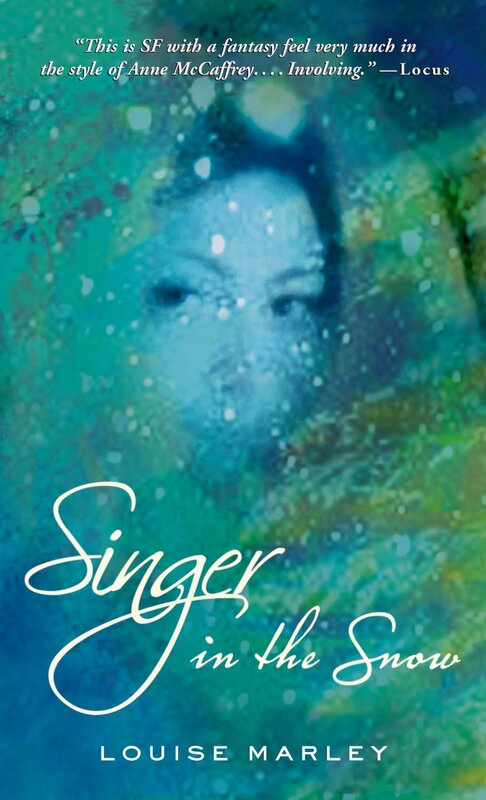 When the brilliant children’s editor, Sharyn November, asked me for a young adult novel, a book set in the world of The Singers of Nevya was the perfect choice. It was lovely revisiting this romantic, challenging planet. Not only is it a beautiful and intriguing world to spend time in, but my return to it reminded me of my early days as a writer, not knowing if or when I might be published, if anyone would care to read what I had written, or if I had more than one worthy idea to explore! I’m delighted to say that the early reviews of Singer in the Snow are all I could hope for, and I also hope that the young adult readers who first discovered Nevya, and who are now a bit older, will still want to read about the Singers who live there. Nevya is an “ice planet” without technology, so cold that to be outside after nightfall means certain death.The Nevyans rely on their Singers, who are trained to channel psi energy through music to create heat and light. Mreen is one of the most talented Singers at the Nevyan Conservatory—but she is unable to speak aloud. Her companion and interpreter when she is assigned to the community of Tarus is Emle, who, despite considerable training, has never been able to channel her psi. The two young women, so long sheltered by the Conservatory, face many challenges, including learning how to relate to each other. They then find out about young Gwin, whose abusive stepfather wants to exploit her psi-Gift talents—and in reaching out to help her, Mreen and Emle also help themselves. Marley has written several books already about the world of Nevya, but this is the first I have read. Her story of the singers who are so essential to survival on this ice world completely captivated me, so I'm sure this story could stand on its own for others too. Of course, it's so intriguing, it will encourage us to find the other books about the Singers of Nevya: Sing the Light; Sing the Warmth; Receive the Gift. In this ice-bound world, music has evolved to alter the air and create warmth. Little children who have the gift are separated from their families and spend long years in training at the Conservatory, learning the music and learning to use their psi to generate heat. When they are ready, they are sent to outposts where they are healers, and where they create the energy for heat. Marley then puts dramatic events and intriguing characters into the setting. A young girl, Emle, who is a gifted singer but for some reason lacks the ability to focus her psi to create heat, is sent to an outpost as a companion to another Cantor. There Emle becomes involved with a troubled family. An abusive stepfather is terrorizing his wife, his almost-grown stepson, Luke, and his little stepdaughter, Gwin. This plot has many ingredients of all successful YA novels: young people trying to realize their potential; young people encountering evil and struggling to prevail; young people with difficult family situations finding their way to responsible adulthood. Marley "has degrees in music and has sung professionally" and her familiarity with music obviously gives this story added believability. Another successful book she has written is The Glass Harmonica, which some of you may know. Mesmerizing, just as the music must be. After almost 10 years, since the conclusion of her Singers of Nevya trilogy (Sing the Light, Sing the Warmth and Receive the Gift), Louise Marley returns to the ice planet with a science fantasy masterwork about two unique young women struggling to realize their potential. On the planet of Nevya, a world without any advanced technology where summer only comes every five years, simply being outside at the wrong time can mean certain death. The Nevyans depend solely on Singers - Gifted individuals with the ability to channel psi energy through music to create heat and light - for survival. Mreen is one of the most powerful psi channelers Nevya has ever seen: except she's completely mute. Emle, on the other hand, is an exceptional Singer who can't productively channel her energy. When the two are sent from the shelter of the Nevyan Conservatory to a distant outpost, they must rely on each other for strength. But once at Tarus, their problems become secondary as the two become involved in a young Gifted girl's life-and-death struggle to survive a negligent mother and a violently abusive stepfather. From the beautifully lyrical writing style and deeply heartfelt themes to the extraordinary cover art and design, Marley's Singer in the Snow is truly magical. While categorized as a young adult title, this novel can - and should - be read by science fiction and fantasy fans of all ages. Remember the first time you read Le Guin's Earthsea novels or Tolkien's Lord of the Rings? All that timeless magic and wisdom is just as powerful in Marley's latest - an instant classic. As with all of Marley's novels, Singer in the Snow revolves around strongly drawn characters and their problems. All the protagonists in this book are compelling and realistic and it's easy to get swept into their stories. And Marley's love of music gives a real depth to her depiction of the cantrixes, their training, and the sacrifices they're expected to make for their art. I also enjoyed the depiction of the summer that only comes every four years when Nevya's second sun appears over the horizon, melting the snow for a few brief weeks. . . . This is a young adult book but it's very readable for an adult audience as well. Set in the same sphere as the "Singers of Nevya" trilogy (Ace), this is an engaging tale of a world in which only the psionic powers of the Singers (those who use music to focus energy and light) can create enough warmth for survival. At the Conservatory, Mreen is a Singer who cannot speak but can communicate psionically. Emle is the opposite; she has a beautiful voice but cannot control her psi to produce warmth and light. When Mreen is assigned to be a Cantrix at Tarus, Emle accompanies her to act as her voice. There they meet Gwin, a girl with the Gift who is abused by her stepfather. In their efforts to help her, both come to terms with their respective issues. Astute readers will guess from the start that Emle's difficulty lies in a childhood trauma, and that Mreen's muteness may be linked to her shame about her mother, a Cantrix who broke her vows of celibacy. Nevya itself is a fascinating world, reminiscent of Anne McCaffrey's Pern. Some elements are not fully explained; for example, why summer only occurs every five years, or even how long it lasts. Still, the story should attract science-fiction fans and may inspire them to seek the "Nevya" trilogy. A professional singer and degreed musician herself, the author has created a believable world in which the power of the human voice is the channel for psi energy. Those able to tap into this extraordinary energy are essential on the "ice planet" of Nevya, where summer occurs only at five year intervals. They provide the lifesaving heat to keep the people and their protected compounds alive during the prolonged periods of extreme cold. There are even itinerate singers who travel with those who must go beyond the confines of the various Houses. The newest Conservatory-trained Cantrix, Mreen, is being sent to the House of Tarus to take over the position of a retiring Cantor. Mreen is most unusual in that she cannot utter a sound but is able to channel her energy through her playing of the filla. She uses "finger signs" to communicate with those who do not have the "gift" and cannot communicate telepathically. (ASL signers will be fascinated with this aspect of the book.) Her traveling companion, Emily, can sing and play beautifully but cannot channel her psi energy to create heat. Of course, as the story line progresses in this well-developed and realistically described world, they discover their own tremendous strengths as they endeavor to help a young child who has the "gift" but is being mistreated by her cruel stepfather. This title is set in the same world as Sing in the Light, Sing the Warmth, and Receive the Gift. With well-developed characters and enough of a variety of subplots, this fantasy addresses the very human emotions of those facing the unknown, difficult family situations, and the development of skills to deal with the universal problems that young adults faceas they venture into the world of adulthood—no matter what kind of planet they inhabit. The pace is well defined and the story line includes enough action to keep the pages turning to the satisfying ending. Marley returns to the ice planet Nevya for this offering aimed at young adults. Mreen, one of the most gifted students at Conservatory focuses psi energy through her music to create light and warmth, or quiru, so effectively that she glows with light. Unlike other students at Conservatory, however, she does not sing; she has no voice. Emle is a talented Singer, but she cannot create quiru. When Mreen becomes a Cantrix and is assigned to a House, Emle accompanies her to be her voice until the new community can learn Mreen's sign language. At the House of Tarus, Luke, a stable apprentice, bridles under the rough treatment that his mother, sister, and he experience from his abusive stepfather, Axl. The new Cantrix and Emle sense the tension, and they are both drawn into Luke's dilemma. At the same time, both Mreen and Emle acquire insight into their personal difficulties, particularly Emle. Marley allows these revelations to unfold naturally with convincing results. Rather than acquiring instant resolution, each woman must absorb new understanding before being able to act upon it. Although the beginning is a bit slow, Marley deftly balances authentic characterization with a compelling plot, often surprising the reader through revealing and subtle insight into the characters. Marley maintains her usually tightly paced plot without sacrificing characterization: The characters are multidimensional and complex. Marley's frozen world will draw in readers who will bask in the light of her narrative and likely seek out the earlier books.